This small néo-bistro located in an out-of-the-way neighbourhood in the 5th may have only opened in late December, but it’s already getting lots of press, and with good reason. 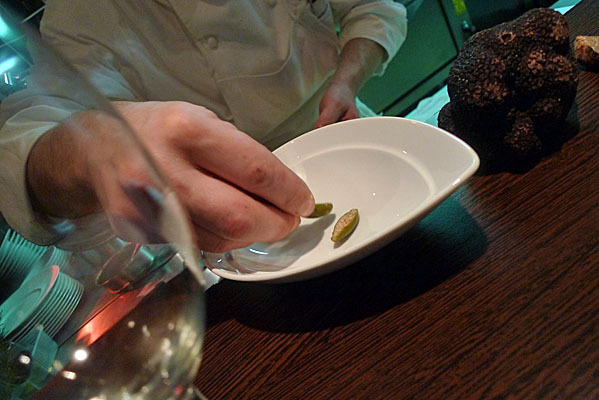 The simple, modern dining room may not be much to look at, but the food more than compensates and the prices are unbeatable considering the quality and attention given to the food. The night started on a low note. Our hard-to-get reservation at the counter overlooking the open kitchen was botched and we ended up in the dining room. 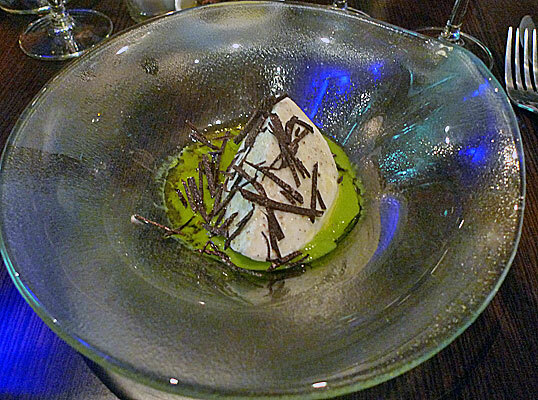 A round of drinks and many apologies followed however and our disappointment vanished with the first course of the 35 € tasting menu, a delicious combination of creamy buffalo mozzarella, shavings of black truffles and a fragrant asparagus coulis. 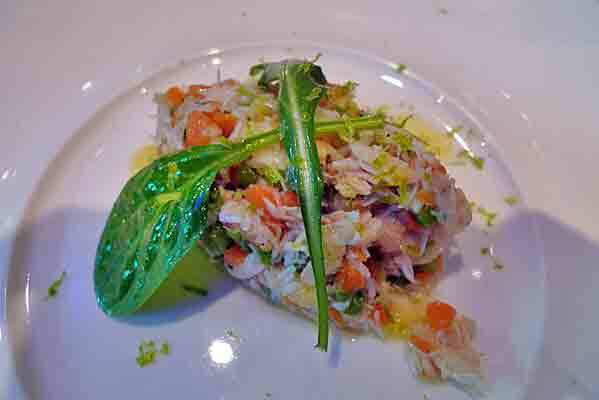 The next course was just as good with delicate shredded crab, “petites legumes”, and a hint of tart green apple and lime. 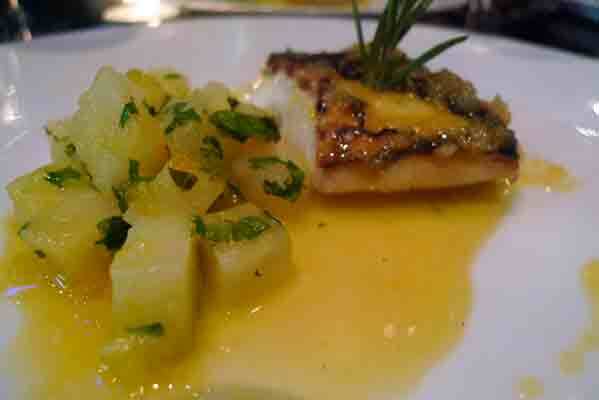 The third course was perfectly cooked roasted merlu (hake) served with celeri rave and a delicate sauce scented with orange zest. 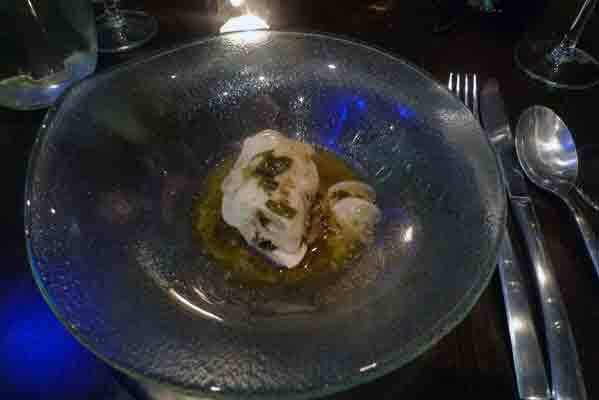 Next came chicken poached in a ginger infused kombu broth, probably my least favourite of the night, but still good. The counter seats finally vacated and we had coffee at the bar and got the chance to talk to the charming chef who offered limoncellos as he finished up for the night. He told us about his stint at Le Bernadin in New York and generously showed off many of the products he uses each night. This is definitely a restaurant I would return to and quick, especially knowing that once word gets out in the mainstream Anglo press, this bargain gastro bistro could soon become a very hard reservation to come by. Closed Sundays and Monday for lunch. Subscribe to comments with RSS	or TrackBack to 'L’Agrume'. Hi Felice, glad to see you are finding the time to reinvigorate your blog and the photos are much appreciated. The new camera must be the difference.